Ok, before I go put on my asbestos underpants and ask on the mothership, let me ask here first. Can you be sharp and intelligent but got bad grades in school? Now it doesn't happen daily, but we do get questions which have literally nothing to do with the topic of the site. The problem is, we don't have a close-reason for that¹. Please note, I am emphatically not asking that we allocate one of our precious three custom close-vote categories to creating a "blatantly off-topic" reason; rather, I'm wondering why that isn't already offered as a standard option. Was "blatantly off-topic" ever offered as a standard close reason on ELU? If so and it was removed, why? I suppose I can imagine people abusing it as the laziest option. What can we do to institute "blatantly off-topic" as a standard (not custom) close reason on EL&U? ¹ Yes, of course I could VtC the question as "other" with a custom message, but that doesn't seem like the right approach to me: first, this is a common enough issue to warrant a standard close reason, second, what would my custom message be, beyond "blatantly off-topic"? I'd also like a fire-and-forget option for closing such questions; they're not worthy of the extra time required to type a custom message, especially on a mobile device. Nevermind, apparently the "blatantly off-topic" close-vote option was universally revoked sometime in 2013. 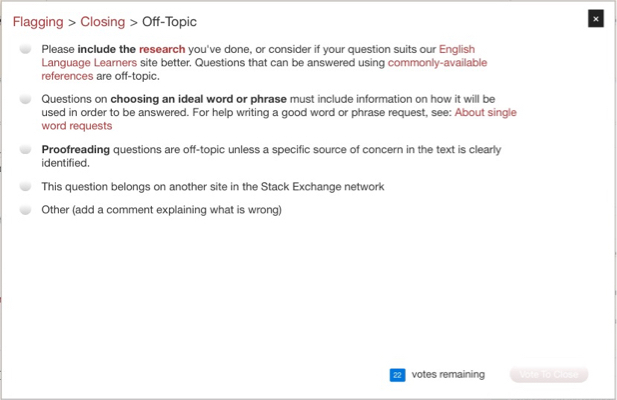 There's still an option to flag questions as blatantly off-topic (hence that screenshot I was able to find), but for actual close-voting, the recommended best practice is indeed to use the "other" category with a custom message. shifts burden of effort to community rather than person asking a wildly untopical question; this effort to clean up after inconsiderate people is even greater on mobile devices. will encourage people to use the wrong category for close voting (case in point: I VtC the example question as "primarily opinion-based", rather than pick "other" and have to think up and type in a custom reason). automatically posts the reason as a comment under the question with the original close-voter's name attached, which destroys anonymity at the worst possible time: when someone is saying "your question is no good". the burden to restore anonymity is again shifted to the wrong person: the user must manually delete that comment (which doesn't, of course, change the fact that it has already appeared for anyone, OP and Google included, to see). willfully ignores the most fundamental reason questions should and will be closed: because they have nothing to do with the site's purpose. Now it's the first reason most people seem to object to, and it is bothersome enough, even to the extent that the powers that be suggest with a wink-and-a-nudge that one doesn't have to type too much more into the message field to get past the minimum length filters. But it's the last reason which really irks me. We're obstinately ignoring the fact that people can, do, and will ask completely irrelevant questions, and at the same time giving up the benefit of being able to gather such questions into an independent category for analysis (the combination of the reality of bullet #2 above, and the fact that custom "other" messages are completely unstructured makes it impossible to reconstruct such a category under the status quo). 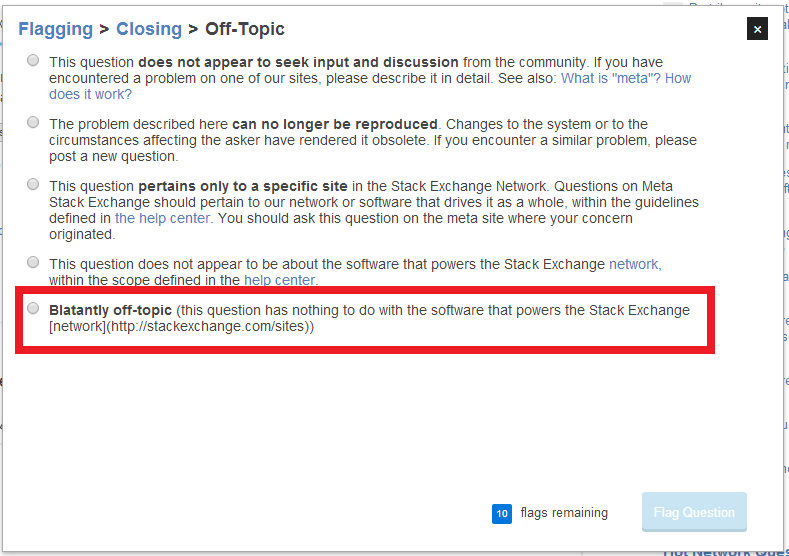 Because really, look at Shog9's suggested close reason in the linked MSE answer: is the really closing the question because it's "about personal relationships"? No, he's closing it because it's not about programming. Not the answer you're looking for? Browse other questions tagged feature-request on-topic-off-topic .